“ … one of the greatest escape artists ever to wield the brush. Ismail is the realm of the enchanted and the enticing, a utopian world built on love, beauty, purity and power.” – Ooi Kok Chuen, art critic. Ismail Latiff’s artworks are always so vibrant, alive and energetic. 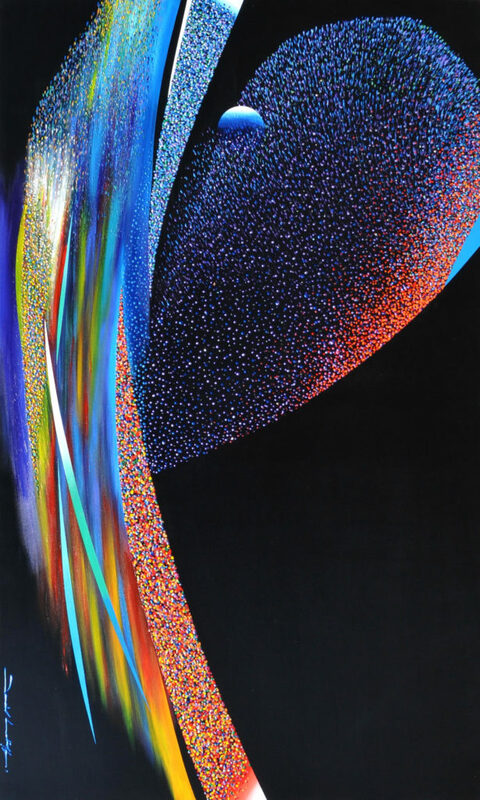 With a harmonious blend of every colour that ever existed, it results in a masterpiece of motion-on-canvas. These are the types of sceneries that one encounters only in dreams or in the figments of the imagination, but very difficult to put into words and even tougher to revisualise. Colourful and voluminous, misting colours are everywhere as they move ever-so-grandly. Ismail Latiff’s circle of balance is placed in the top middle of the canvas, to symbolise the search to become one with the cosmos.